Everyone in this community treats each other with respect and is part of the Black & White family. Our patrols range from relaxed to the hyper-realistic. In addition to this, our community members are dedicated to assisting you and are always there to assist in your journey in our community. 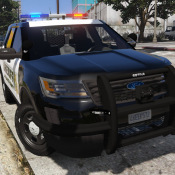 Our community proudly features 3 growing departments; Los Santos Police Department, Los Santos Sheriffs Department, and the Los Santos Regional Comms Center. All departments are accepting applications! Our community features members who are active in the Law Enforcement Community in varying roles. This places Black & White Roleplay a step above the rest. In addition to this, we have vehicle developers, vehicle skin creators, and server managers keeping the community an exciting place to roleplay. The minimum requirements for joining the community is 1. You have to be 14 years or older 2. Have to be mature and willing to learn 3. Must like to have fun in a semi-serious environment. We are always looking for people to join our community and are excited to have you join us. Posted Feb 3, 19 · OP · Last edited Feb 3, 19 by Ace L.